New York- A familiar name in the entertainment circuit of New York and New Jersey will be singing the Philippine National anthem for Manny Pacquiao’s fight this Saturday night (Sunday morning) in Las Vegas. Angel Ram, a Filipino-American based in the Tri-State area is slated to perform the Lupang Hinirang alongside the singing pastors when Pacquiao returns to the ring at the MGM Grand Garden Arena to face American Adrien Broner. Last November, during the initial presser for the fight in New York, Angel approached the fighting senator and made her pitch for one of her dreams. Last month, Angel visited Pacquiao in Los Angeles and she had a chance to sit and talk with Pacquiao a second time. Angel, who was born and raised in Zamboanga City in the Philippines, is now residing in Jersey City, New Jersey. She is a frequent performer in various shows and events in the Tri-State area and the East Coast. In 2017, she represented the USA as an all around singer in the World Championship of Performing Arts (WCOPA) winning a total of 3 awards. She also was just one of few Filipino entertainers who was able to perform at big-name venues in New York City like Cafe Wha, BBKing, Carnegie Hall, Cutting Room, The Town Hall and her recent sold-out Birthday Show at 54 Below. But Saturday night’s performance will be different from her previous gigs. The boxing ring will present a unique venue for the 35 year old performer. Angel will be flying to Vegas from Manila during fight week. 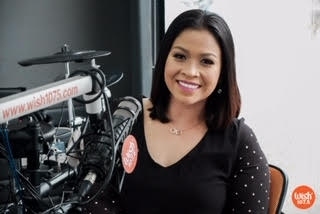 She was a recent guest of the popular Wish Bus series of Wish 107.5 last New Year’s eve in Manila where she performed her original song, “Like a love song” live on air and online. The pretty singer will be singing under the bright lights of Las Vegas in an Edwin Uy designed gown which the designer created especially for her and for Saturday night’s performance. Uy is a favorite designer by beauty contestants from the Philippines. His gowns, dresses and national costumes accented Filipina beauties in their competitions abroad. He won many awards for his creations. The Pacquiao- Broner fight will be beamed live from Las Vegas to the Philippines and all over the world starting at 6 pm Pacific time (10 am in the Philippines). You can reach the writer at rrmaze24@aol.com. Click here to view a list of other articles written by Rich Mazon .